Applicants to download the GPSC Nayab Mamlatdar Call Letter 2018 @ gpsc-ojas.gujarat.gov.in is the Correct Place Here. And for the Candidates sake, GPSC Nayab Mamlatdar Exam date is going to Issue by Gujarat Public Service Commission (GPSC) Board for the Posts of the 412 Deputy Section Officer and Deputy Mamlatdar Jobs. All the Details about the GPSC Nayab Mamlatdar Admit Card we are going to Place Here. So that, candidate without any struggling, they are able to download the Admit card without any worries. We will also proceed the some of the Details regarding the Exam date and the Exam schedule Details Here. GPSC Nayab Mamlatdar Mains Exam Date Changed & Admit Card OUT!!!!!! Latest Update(28th March 2019): GPSC Nayab Mamlatdar Mains Exam Date Changed. The exam dates are 18th May 2019 & 19th May 2019. Check Now all the detailed Information Here. Latest Update(4th Dec 2018): GPSC Deputy Section Officer and Deputy Mamlatdar Call Letter has been released. Download now. GPSC Deputy Section Officer Admit Card is very Important for the Candidates to attend the Examination Perfectly. 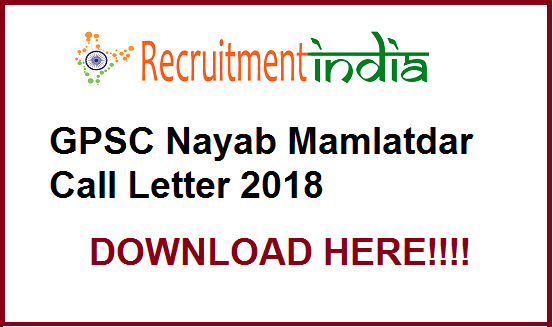 Applicants who have furnished all the Details in their application form for the process in the GPSC Nayab Mamlatdar Recruitment 2018, they are only eligible to download the GPSC Nayab Mamlatdar Call Letter and also capable to attend the Examination. Applicants who will visit the Exam Hall without their GPSC Nayab Mamlatdar Hall Ticket, any invigilators will not give the Permission for that candidates to attend the Examination. To avoid all those silly things in the Exam, carry the Call letter to the Exam. Mostly, the Estimation date of the GPSC Nayab Mamlatdar Exam Date is going to be conducted in January 2018. But candidates who have completed their application form correctly, they have to regularly check the Main Official Page or they have to check our @recruitmentIndia.in page to get all details about the gpsc-ojas.gujarat.gov.in Call letter 2018. A large Number of the applications have been accepted by the Gujarat Public Service Commission Board, so they will take some sort of time to declare the Downloading links about the GPSC Nayab Mamlatdar Call Letter 2018. To get the Perfect Exam date and the venue of the Exam center, candidates have to get the GPSC Nayab Mamlatdar Hall Ticket, Then only it is possible to get al the Details about the Exam scheduled. If there is any Postponed of the Exam, that will also we will announce in this Page Clearly. All the Instructions that were printed on the GPSC Deputy Section Officer Admit Card are very Important for the Candidates. And applicants have to follow each and every Rule that is provided on the backside of Gujarat Nayab Mamlatdar Call Letter. To reach the Venue to the Exam is very important. Those Candidates who will visit the Exam hall late, they are not permitted to enter into the Exam Hall. So candidates along with the GPSC Deputy Section Officer Call Letter, they have to reach the exam Hall Perfect Time. Candidates who will conflict to get the GPSC Nayab Mamlatdar Call Letter 2018, they have to Simply check the Links at the end of this Page. On that candidates have to enter the correct Application Number & Date of Birth Details. If any candidates have entered the wrong number, those Candidates Call Letter will not be displayed. enter the application Number Currently, Mainly the link which we have placed about the gpsc-ojas.gujarat.gov.in Admit Card, that we have taken directly from the Official Page. So all the links are the Updated One. For more Job Chances Visit our Employment News Page.